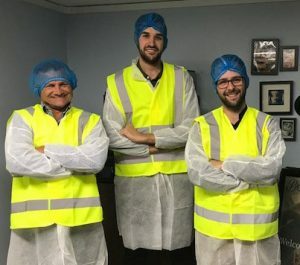 In late July Joe (my purchasing assistant), Miguel (coffee brands manager) and I took the brave step to venture north of Watford Gap Services to visit the Bewley’s Perkee Coffee Roastery in West Yorkshire. Visiting the Roastery gave us a chance to see the entire process of creating Perkee coffee, from the silos holding green, unroasted beans to the finished cup of coffee. The Perkee Coffee Roastery is in Meltham, Holme Valley which is 4.5 miles south-west of Huddersfield, on the edge of the stunning Peak District National Park. My last visit to a Roastery was 4 years ago when I visited the James Aimer in Dundee. In contrast to my first visit which was located in a 100 year old Victorian building, the Perkee Coffee Roastery is in a bright and modern warehouse building. From the outside we had no idea what magic was taking place on the inside! We were introduced to Stuart Hodgson who is the technical coffee manager and Scott Rogers whose normal job is Head of National Accounts but is currently responsible for coffee buying and sourcing (which sounds much more fun!). Scott started life as a barista and is sporting the obligatory arm “Tattoos” to prove it! Our day started with a tour of the factory. To do this we had to get togged up in the mandatory food safety clothing which is never very flattering (as the photo will verify). I reminded myself that it wasn’t a time for catwalk vanity. The tour started in the storage area for the raw green (unroasted) beans. I was particularly interested in where the green (unroasted) coffee beans are stored. We were able to touch and feel our Perkee bean (sourced from the Soppexcca cooperative in Nicaragua) in its raw state. 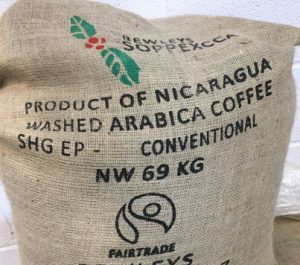 It was a proud moment to see Soppexcca’s very distinctive branding and the Fairtrade trademark on the coffee sacks. We visited the area where the Perkee beans are roasted and observed a small batch of beans being fed into the roasting chamber. We then witnessed the beans in the various stages of roasting and Stuart explained how the colour of the bean, as it roasts, is measured to ensure a perfect result. The air was filled with the aroma of freshly roasted coffee beans. It was delicious. After the tour we had a coffee tasting session often referred to a cupping. Cup the coffee: This doesn’t refer to the act of pouring coffee into a mug, it’s where you cup your hand over the mug to trap the scented steam and inhale it. Sip and slurp: Forget everything your mother taught you about manners. Go ahead, slurp that coffee into your mouth. Make sure you get some air in there and concentrate on what you taste. Location: what are you tasting? Where does the coffee flavour and body hit first on your tongue? Is it the middle, the sides, or maybe even the back of your tongue that comes alive and experiences the coffee first? The social part: Now comes the talking part. Share and compare your notes with others at the coffee tasting. It’s a fun part of the process to see who has similar tastes and if there’s one particular coffee that everyone loved or didn’t. 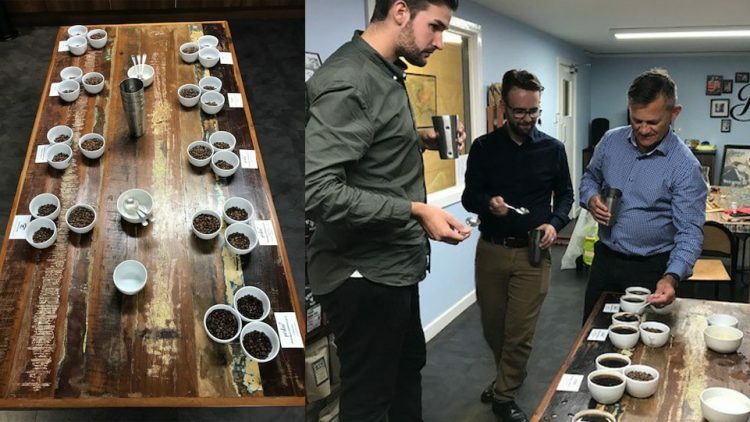 We had eight different beans to work our way through, which included our Perkee coffee bean along with 2 other lighter roasts that Miguel is currently developing with Stuart. I have to say that my ability to appreciate the subtle nuances of coffee is woefully inadequate, but we all have to start somewhere. And with Stuart’s guidance, I definitely feel my coffee journey has started. It was a great experience visiting the Perkee Coffee Roastery and all joking aside I could taste the difference between the beans. Albeit not in the detail that Stuart was describing, but he has many years of coffee tasting experience under his belt. It was an informative day and I feel that my senses have been sufficiently developed so that I can almost appreciate coffee as much as I do red wine.